I get rave reviews from this everytime I take it to parties. It is very simple, fresh, and spicy. 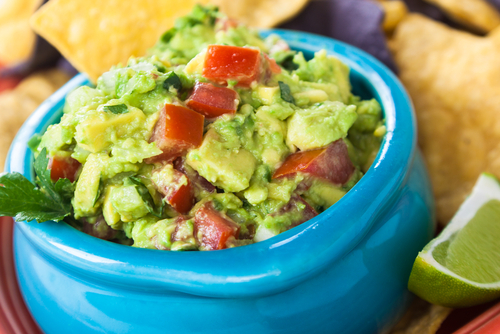 Mash the avocados in a large, chilled serving bowl with the back of a fork. Stir in chopped vegetables and add lime juice, salt and pepper. Can be refrigerated for a few hours, but after this time it starts to get brown. Serve as soon as possible with chips. I also really like to eat this on simple tacos with just some grilled, seasoned meat and sauteed colored peppers (more like a fajita). Serving size: about 1/3 cup.